Why is the guitar such a popular instrument to learn? Many great musicians are guitar players, so guitar students can draw inspiration from a rich history of excellent musicianship. What are some of the reasons that the guitar remains such a popular instrument for students of all ages? Guitar is popular both as a solo instrument and is a fundamental part of a band. Guitar players are able to play with other musicians in a group setting and the guitar is also enjoyable to play and hear on its own. Students can play the melody of a guitar riff or solo, as well as the harmonies of any song. 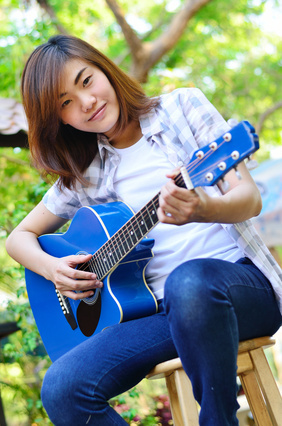 Depending on the interests of the individual, guitar students can work on playing and singing at the same time. The guitar is a versatile instrument: the guitar is portable and almost any style of music can be learned and played on the guitar. Guitar students can explore different types of songs and genres in order to find the music that best inspires them. For information about guitar lessons at the Altadena Academy of Music, please call (626) 296-0799 or use our email contact form. This entry was posted in Acoustic Guitar Lessons, Bass Guitar Lessons, Electric Guitar Lessons, Guitar Lessons and tagged Guitar Lessons by altamusicschool. Bookmark the permalink.